Joe Versus the Volcano is a 1990 American romantic comedy film written and directed by John Patrick Shanley and starring Tom Hanks and Meg Ryan. Hanks plays a man who, after being told he is dying of a rare disease, accepts a financial offer to travel to a South Pacific island and throw himself into a volcano on behalf of the superstitious natives. Along the way, he meets and falls in love with the woman taking him there. The film received mixed reviews overall, but positive reviews from some critics, including Roger Ebert, who described the film as "new and fresh and not shy of taking chances," and was a minor box office success in the US. It has since become a cult film. Joe Banks is a downtrodden everyman from Staten Island, working a clerical job in a dreary factory for an unpleasant, demanding boss, Frank Waturi. Joyless, listless and chronically sick, Banks regularly visits doctors who can find nothing wrong with him. Finally, Dr. Ellison diagnoses an incurable disease called a "brain cloud", which has no symptoms, but will kill Joe within five or six months. Ellison says that Joe's ailments are psychosomatic, caused by his experiences in his previous job as a firefighter. Ellison advises him, "You have some life left ... live it well." Joe tells his boss off, quits his job, and asks former coworker DeDe out on a date, but when he tells her that he is dying, she becomes upset and leaves. The next day, a wealthy industrialist named Samuel Graynamore unexpectedly makes Joe a proposition. Graynamore needs "bubaru", a mineral essential for manufacturing superconductors. There are deposits of it on the tiny Pacific island of Waponi Woo. The resident Waponis will only let him mine it if he solves a problem for them. They believe that the fire god of the volcano on their island must be appeased by a voluntary human sacrifice once every century, but none of the Waponis are willing to volunteer this time around. Graynamore offers to pay for whatever Joe wants to enjoy his final days, as long as he jumps into the volcano within 20 days. With nothing to lose, Joe accepts. Joe spends a day and a night out on the town in New York City, where he solicits advice on everything from style to living life to the fullest from his wise chauffeur Marshall. He also purchases four top-of-the-line, handcrafted, waterproof steamer trunks from a fanatically dedicated luggage salesman. Joe then flies to Los Angeles, where he is met by one of Graynamore's daughters, Angelica, a flighty socialite who labels herself a "flibbertigibbet". The next morning, Angelica takes Joe to a yacht, the Tweedledee, owned by her father. The captain is her half-sister Patricia. Patricia reluctantly agreed to take Joe to Waponi Woo after Graynamore promised to give her the yacht in return. After an awkward beginning, Joe and Patricia begin to bond. Then they run into a typhoon. Patricia is knocked unconscious and flung overboard. After Joe jumps in to rescue her, lightning strikes, sinking the yacht. Joe is able to construct a raft by lashing together his steamer trunks. Patricia does not regain consciousness for several days. Joe doles out the small supply of fresh water to her, while he gradually becomes delirious from thirst. He experiences a revelation during his delirium and thanks God for his life. When Patricia finally awakens, she is deeply touched by Joe's self-sacrifice. They then find that they have luckily drifted to their destination. The Waponis treat them to a grand feast. Their chief asks one last time if anyone else will volunteer, but there are no takers and Joe heads to the volcano. Patricia tries to stop him, declaring her love for him. He admits he loves her as well, "but the timing stinks." Patricia persuades Joe to have the chief marry them. Afterwards, Patricia refuses to be separated from Joe. When he is unable to dissuade her, they jump in together, but the volcano erupts at that moment, blowing them out into the ocean. The island sinks, but Joe and Patricia land near their trusty steamer trunks. At first ecstatic about their miraculous salvation, Joe tells Patricia about his fatal brain cloud. She recognizes the name of Joe's doctor as that of her father's crony and realizes that Joe has been set up. He is not dying and they can live happily ever after. The film earned mixed reviews from critics. Vincent Canby wrote "Not since Howard the Duck has there been a big-budget comedy with feet as flat as those of Joe Versus the Volcano. Many gifted people contributed to it, but there's no disbelieving the grim evidence on the screen." Upon its release, Time called it a "wan bit of whimsy ... [that] makes no more sense than its synopsis, though Meg Ryan beguiles in three different roles." Fifteen years later, Time critic Richard Schickel listed it as one of his "Guilty Pleasures"; while acknowledging "there are people who think this film... may be the worst big budget film of modern times," Schickel disagreed, saying "if you set aside the routine comic expectations its marketing encouraged, you may find yourself entranced by a movie that is utterly sui generis." Roger Ebert gave it 3.5 out of 4 stars and called it "new and fresh and not shy of taking chances"; the film "achieves a kind of magnificent goofiness. Hanks and Ryan are the right actors to inhabit it, because you can never catch them going for a gag that isn't there: They inhabit the logic of this bizarre world and play by its rules." He later brought the film to Ebertfest 2012 and wondered "why he gave 3.5 stars instead of 4." 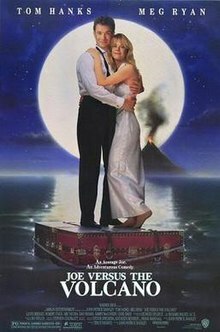 As of August 2018, Joe Versus the Volcano holds a rating of 62% on Rotten Tomatoes based on 29 reviews. The soundtrack, composed by Georges Delerue, was released in very limited numbers as a promotional item. Only 3000 copies were manufactured in 1990, the year of the movie's release. Because of Delerue's strong following, Varèse Sarabande re-released the CD in 2002. Shanley wrote two songs for the film, "Marooned Without You" and "The Cowboy Song", the former used thematically throughout and the latter performed by Hanks on the ukulele. Eric Burdon's version of Merle Travis's "Sixteen Tons" was used at the beginning of the film. After Joe leaves the doctor's office, an edited version of Ray Charles's version of "Ol' Man River" plays. "Mas Que Nada" by Sergio Mendes & Brazil '66 accompanies Joe while he is driven around New York City. A Spanish version of "On The Street Where You Live" is sung while Joe is on his date with DeDe. Elvis Presley's version of "Blue Moon" plays as Joe spends his final night before departing on his journey. On the boat trip, the Young Rascals' "Good Lovin'", the Del Vikings "Come Go with Me", and The Ink Spots' version of "I Cover the Waterfront" are heard. Waponi tribal music includes the melodies "When Johnny Comes Marching Home" and "Hava Nagila." The film was first released on home video in late 1990 and was later released on DVD by Warner Home Video in April 2002. The Blu-ray was released as part of the Warner Archive Collection on June 20, 2017 and received positive reviews for its quality. In 2012, San Diego's Lambs Players Theatre presented the world premiere of a musical based on the film. Directed by Robert Smyth, it featured a book, music and lyrics by Scott Hafso and Darcy Phillips. ^ "Joe Versus the Volcano (PG)". British Board of Film Classification. April 25, 1990. Retrieved December 3, 2016. ^ "Joe Versus the Volcano". Box Office Mojo. Retrieved October 21, 2013. ^ "Cult Films". AMC Filmsite. Retrieved October 26, 2013. ^ Andy Greene (10 September 2014). "Readers' Poll: The 10 Best Tom Hanks Movies". Rolling Stone. Retrieved 22 March 2018. ^ Erickson, Glenn. "DVD Savant Review:Joe Versus the Volcano". DVD Savant. Retrieved October 26, 2013. ...Joe versus the Volcano has accumulated an impressive cult (sorry, no other word applies) following. ^ Nathan Rabin (June 12, 2007). "My Year of Flops Case File #40 Joe Versus the Volcano". The A.V. Club. Retrieved October 26, 2013. ^ Canby, Vincent (March 9, 1990). "A Terminal Ad Man, a God, And a South Pacific Volcano". The New York Times. Retrieved April 30, 2017. ^ Sachs, Andrea (April 2, 1990). "Critics Voices". Time. Retrieved April 30, 2017. (Subscription required (help)). ^ Schickel, Richard (January 19, 2010). "Joe Versus the Volcano, 1990, John Patrick Shanley, U.S." Time. Retrieved April 30, 2017. ^ Ebert, Roger (March 9, 1990). "Joe Versus the Volcano". RogerEbert.com. Ebert Digital LLC. Retrieved April 30, 2017. ^ Ebert, Roger (March 20, 2012). "Introducing the films of Ebertfest 2012". RogerEbert.com. Ebert Digital LLC. Retrieved April 30, 2017. ^ "Joe Versus the Volcano - Georges Delerue". Soundtrack-express.com. Archived from the original on July 23, 2011. Retrieved August 11, 2011. ^ "Varese Sarabande". Soundtrack.net. Retrieved 2011-08-11. ^ "Review Joe Versus the Volcano". Blu-Ray.com. June 20, 2017. Retrieved July 18, 2017. ^ "Lambs Players". lambsplayers.org. Retrieved 2014-02-09. This page was last edited on 11 March 2019, at 05:40 (UTC).